If you've used Google Reader on your UMPC in the past you've probably been frustrated a bit by the little space available for reading the posts. The good news is that it is now possible in the Expanded View to expand the reading area by clicking the little arrow on the left. ... much better! You can collapse the post reading area to get the menu back by clicking the little arrow on the left again. 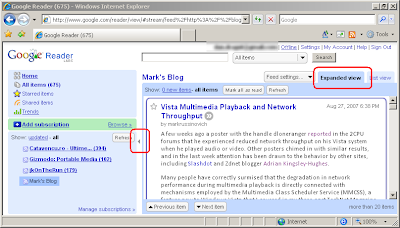 Now if you still need more space you can use the Full Screen feature in IE (right click the IE toolbar area, choose Customize command bar and bring the Full screen button in the bar). Here if the full screen web page in it's glory! To exit the full screen mode, move the mouse in the top screen area and then push the Full screen button again.